The 400th season has started with Plymouth which kicked off with activities this year. Gloucester is planning for 2023. There may be others already at work. At the same time, we need to look at the 200th which would have been the activities post the Revolution, the Quasi-War, and the War of 1812. We had movement west, such as seen with Jedediah Strong Smith. The 300th had lots of activity about which we can ferret out information: Pageant of Salem. This time around we will have the web and will leave all sort of tracks. And example is The Lafayette Trail which is following the travels of General Lafayette in the U.S. As this story tells us, a French Geographer has gotten attention and support for tracing Lafayette in his tour of America. Jedediah had already passed through St. Louis before Lafayette got there. In his magazine (The Massaachusetts Magazine), Dr. Frank had authors who were involved in U.S. events during early and middle nineteenth century. One example is Judge Thompson who ventured west and returned to New England where he was a Judge. Franklin Benjamin Sanborn wrote about several of the earlier personalities. As the 400ths unfold, we can follow the 200ths, as well, as raise the awareness of things forgotten or left behind. We have just became aware of the Gloucester 400th planning committee's work. That will be a continuing theme. These are the announcements, in order by time. It was great to see the progress. We intend to be more aware and support the effort. 04/20/2019 -- FB page: Gloucester 400. Also, we are looking, in parallel, at the 200ths (see General Lafayette) as the 400ths weave (see The 1st Year) through the coming years. Note: Gloucester has started its 400th planning. A continuing theme will be the History of New England. Attempts at this theme were done early on. We will review those attempts. All through the years, there have been other look backs. What needs to be done is to develop a personal view. This will take time and effort and research. We are now fifteen generations, or so, past Thomas' and Margaret's time in New England. Our modern life is far removed from what they saw on arrival. We want to look further at their lives from the beginning here as well as before. We can start a look back since we know more about Margaret. Since Cape Ann is the focus early, we will look at it time and again. 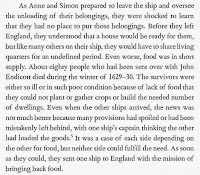 As an aside, let's see the remarks of Anne Bradstreet who came over several years later with the Winthrop fleet. "They were shocked," we see. 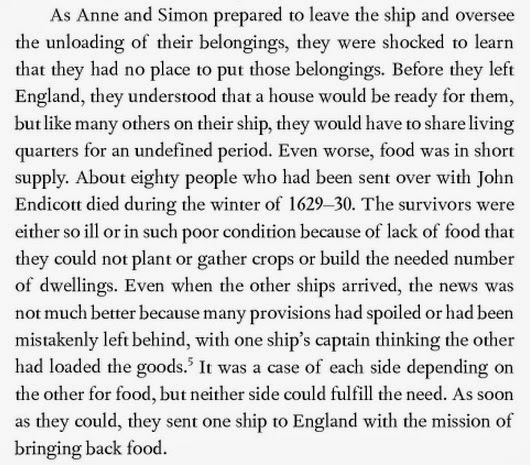 Before leaving England, they were told that there would be a house ready for them. What did they find? They would have to share living quarters. We look at those quarters, below. Not only was there lack of housing, later on there were too many people. As the report notes, eighty people had died in the winter of 1629-30. For the early crew, we have not heard that there were deaths. In comparison, the Popham crew (1607)went into Maine and lost no one over the winter. In fact, they also built a sea-going vessel. They gave up the colony since the leader had a death in the family, and no one wanted to take his place. So, what was it like that first winter and the next few years? We know that Thomas brought a house with him. We have written of this earlier. See Wikipedia (Great House - Cape Ann). Unfortunately, it was moved from Cape Ann to Salem by John Endicott. He hosted John Winthrop there when that party arrived on the Arabella. Also, Winthrop remarked about the house, as did Higginson, earlier. This left photo shows a replica based upon study of material from that era. It was built for the 300th anniversary by George Francis Dow. It was two stories. John Goff wrote of the house as he looked into the details of Pioneer Village. Most of the material for the house was brought with the crew. One expert remarked that the house had been built to move. After Endicott had it moved to Salem, it had an interesting history, ending up as part of another building in Salem. Later, the house was extended with another floor added. 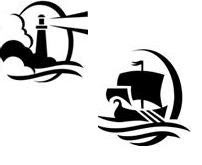 The image on the right was drawn from memory and given us by the Conant family as they had lived in the house after Roger came into Cape Ann. One might say that this event was the first transfer of power, from Thomas to Roger. Later, we know that John took over. Where did Thomas and Margaret go? First, consider everyone else was living in a wigwam. Houses were being built, but there was an issue of material as well as skilled labor. We see in the records that carpenters, for instance, were well received where ever they went. The Bigelow family site has a couple of renditions that we can reference. The left photo shows the framework for the wigwam. Note that we are looking at a later rendition. When Thomas and Margaret arrived, the structure would have been more crude, not unlike we would see with a camping site today. There was a door on one end with the fireplace on the other. Prior wigwam's might has only allowed for a small fire. We will be looking at weather, for instance. We know that several winters were quite extreme (General crisis) during the early New England period. For instance, the Thames froze in 1620. Several years were very cool which inhibited farming. The right photo shows the wigwam covered with rush. Some might have tried to use canvas. We know that a good weave of the rush would prevent water from getting in. Insulation would be a problem, though. And, heavy snow could be a contributor to collapse as well as leakage through melt. Finally, on the left is an interior view from the Pioneer Village exhibit. 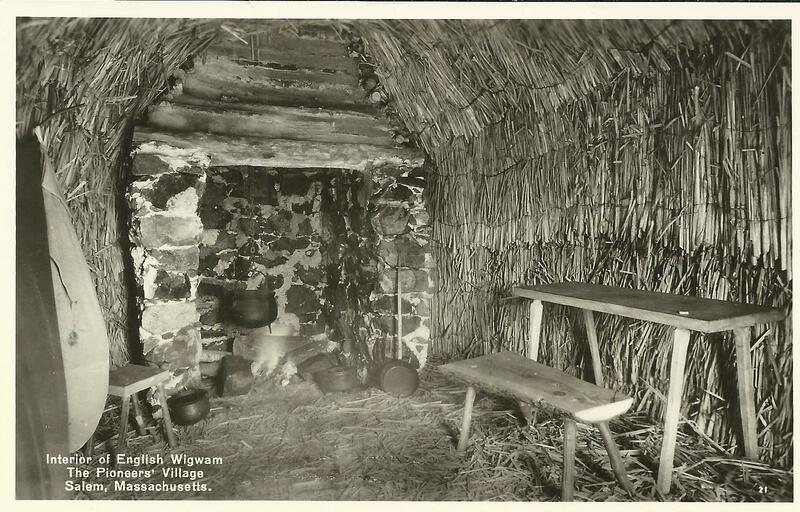 The wigwam could have been considered cozy with a fire going, however the walls would shake with the wind. After a snow fall, one would be hoping that there was no too much of a drift into the wigwam or along the access.These thoughts are apropos given that we are just past a snowy winter. The re-look at history ought to take a bit of time. We can think about how to present this material. Right now, there are blog posts. Too, there is the index by image at our portal. But, the media choices today are quite wide. In every period that we look, we will try to find all of the material that may pertain that has been collected by other researchers. So, one benefit we expect to provide is a site where correct and pertinent material is accessible through time. There were several early tales from New England. In our Bibliography (which is a continuing bit of work), we have tried to collect links to on-line versions of these. Below is an incomplete list that has only some of the earlier ones. We'll pick one, in particular, for this post. The motivation comes from adding in more text from The Gardner Annals, Vol. I, No. 1 in which we collected entries from various issues of Gardner's Beacon to our portal. The first introduction of this included entries from Thomas' birth (1590s) to his death (1674). Lately, we added in more from the period of 1675 to the present. The last entry was 2009 and related to the work of John Goff. While editing the text, I noticed reference to a 1747 work by Neal. He mentioned Joseph Gardner. So that precipitated a review. This time we want to look at Neal's book. To set the stage, in 1887 a book looked at early works from which we could learn the history: Narrative and Critical History of America: The English and French in North America by Justin Winsor. The author mentions Cotton Mather's The Ecclesiastical History of New England from 1620 to 1698 (which is not on our biblio, yet) and says that Neal was a successor to Mather. Except, Neal was never here and wrote from material available to him in England. Hence, he took his knocks from later researchers. However, my attention was drawn to his description of the campaign in which Joseph was killed. So, let's look at the book in terms related to our themes. In Volume 1, Neal reports on a survey of Christian activity. He quotes a letter from John Gardner of Nantucket who wrote in 1694 (pg. 255) about the churches in the area. Neal was reporting this same activity throughout Massachusetts. Neal also spent some time describing the experience of the Quakers. He got criticized for this by later authors. However, the amount of material that he had access to was remarkable, given the times. Of the letter by John, to whom was this addressed? In this first Volume, Neal lists the prior work. So, we'll have to go back through that and expand the coverage to the other colonies, such as Plymouth. Volume 2 starts out after the first forty peaceful years with the conflict with Philip. Hubbard, as well, wrote of these troubles. Neal references the book, so he must have seen the manuscript. Again, Neal is quite descriptive. The troubles were experienced out in Deerfield which is far afield. On page 13, Neal begins a look at conditions before Joseph's death with five others. While reviewing the material, I saw one footnote regarding the Pequot War, which was earlier, that led to this book: Relation of the Pequot Wars (1660) Lion Gardener (we took a brief look at this family, earlier - Gardiner's Island). He does not mention Joseph, in particular, but he does have the viewpoint of a participant that ought to be of interest. 04/20/2019 -- We have looked at The 1st Year. Also; Gloucester is planning their 400th. This post reviews various types of puzzles that we can encounter. We first addressed the issue of errors in October of 2010: Stories and unwindings. Then, again, in December of 2010: Family traditions. The first post mentioned the variations on the theme that one gets in reading material on the internet. A later post looked 'Historic puzzles' which dealt with conflicting information on the web of differing age and provenance. To where does one turn after resolving an issue. We published two articles in The Essex Genealogist related to that theme (TEG, Vol 34). With respect to Thomas and Margaret, we have addressed some of these. The FAQ is a start on an approach that might be reasonable. That was motivated, in part, by trying to assess what we really knew then (or know, at any point). One reason for the 'Remarks' section on these posts is to link to information known down the line. The 'What we know' post has additional comments dated from 2012 to 2018. Many posts are being updated as we add images for our index. As would be expected, origins are a huge theme of interest. We found more information about Margaret. There have been many other viewpoints presented. Our intent is to gather these; eventually, we will publish them with some commentary. Examples: Neville in the tree? ; Thomas' sister Rachel? ; Who was on the boat? ; Common query: Am I related to Thomas? ; and more. The work of Gardner Research will not be without interesting puzzles and knots. On the other side, we do not want to introduce more complication. Some errors have cropped up. They may have been typos (a couple of places, the wrong year for the publication of the 'Gardner Memorial' book). Others were not following up on sources (see below). Some were oversights (or new information came about). We address this issue on the Publications page of our portal and will be thorough in our handling of this type of change. After we wrote a brief article about Dr. Frank back in 2015 (The Gardner Annals, Vol. II, No. 2), we created a record on findagrave for him. We found a grave record for his daughter, Pauline. In the article, we mentioned that her burial was in Whitefield, ME. It should have been Sheepscot Cemetery in Newcastle, ME. We learned of this from Pauline's grandson, Philip Carlton Donnell. In researching his grandfather (who was the son-in-law of Dr. Frank), Philip C. uncovered many stories that can be told. 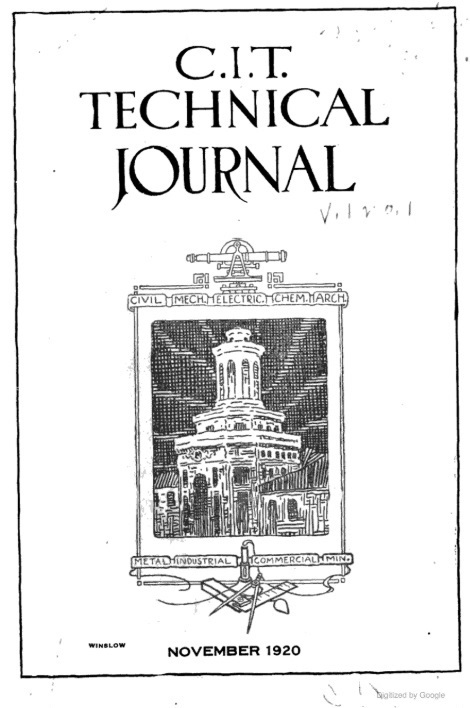 As a brief introduction, this article in the Carnegie Institute of Technology Technical Journal (Volume 1, 1920) by Philip Stone Donnell provides a historic view: Three Years with the United States Coast and Geodetic Coast Survey. As we will see with his story, Philip S. was an officer in the U.S. Army and an administrator with the WPA. The title comes from a series of articles dealing with The General Crisis. These were published in 1954 by a British Historian. The topic dealt with turmoil and troubles in the 17th Century, globally. Earlier, in terms of motivation, we touched upon the topic of Plus or Minus the Arrival (1 Mar 2013) when I was still a newbie in this type of work. I think of this as the smoking cigarette post, due to the image that shows the Royal reigns during Thomas' years. Earlier, I had looked at a topic that relates to the General Crisis which was the Black Plague (18 Nov 2012). Then, we started the 'annals' look with Gardner's Beacon (Vol. II, No. 6). I have been looking at these items which were carried into the first edition of The Gardner Annals. And, of late, they are presented on our new portal in random order with the intent to scroll. That got me to reading these to identify necessary changes which is pending. 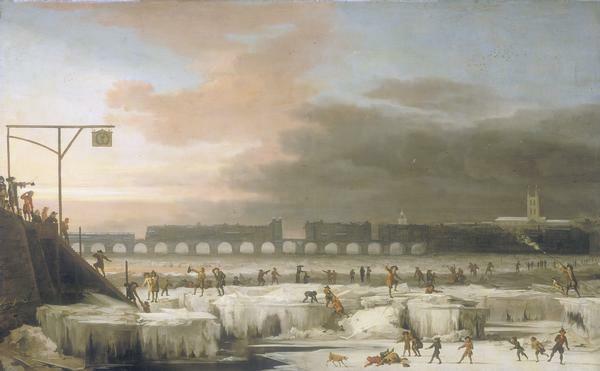 Another of the events was a Little Ice Age. The Thames froze as depicted in the painting. Crops failed. 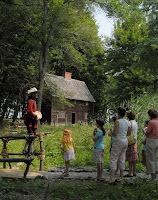 I have run across accounts about life in New England during the time. Several other events that will be of interest: the Thirty Years' War, the English Civil War, several areas lost a large percentage of the population, climate change. We have unclear situations on both ends of Thomas' curriculum vitae (so to speak). Part of our effort has been an attempt at filling in pieces. We have more information about Margaret, now. But, 'whence' is an open issue. We have summary that will be updated from time to time. We have figured out that Thomas' remains were lost: Gardner's Beacon, Vol. IX, Vol. 1. We know that Margaret and Thomas lived in Sherborne where they married and had the first of their children. Records suggest (absence of such) that the family moved. The children's name match those of the Cape Ann couple: Sherborne, Dorset. In a discussion, I heard about a case in the Singapore where graves were dumped in a river to make room for a road. The families complained, to no consequence. 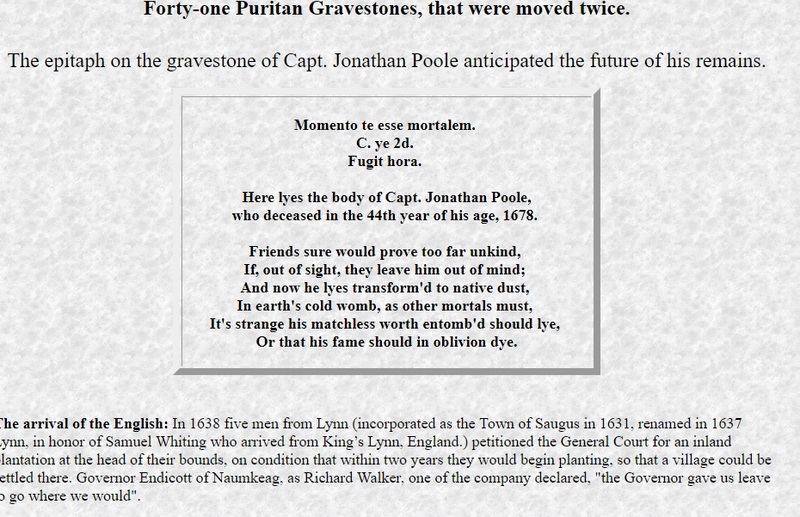 So, while looking at whence issues today, I ran across this blog post: These Forty-one Puritan Gravestones. It talks about gravestones being moved without the bodies. It happened to these stone twice. Ah, New England was Christian? Or money hungry? The significance with this post about the 41 graves are several. Trask is a Cape Ann family. Too, Sidney Perley mentioned that some graves had been moved from Gardner's burial plot to the Trask plot which was almost adjoining. That motivated this New Twist post. 03/02/2019 -- No, forty-one was minor. Now, it's 200 or so. That's not counting those interned at Gardner's Hill. All in little Essex County.